Millions of businesses worldwide rely on Google AdWords Pay Per Click (PPC) campaigns to generate high quality and profitable leads. If you are not using Google Adwords — and your competitors are — then chances are you are losing sales to your Adwords competitors. We are experts at setting up cost-effective Google AdWords and other internet advertising campaigns that reach your perfect customer at the moment they are ready to buy, when they are searching online for the products or services you offer. We know how to research and reverse engineer your competitors’ ad campaigns to help you win a greater share of business — a skill that neither you nor your in-house staff are likely to have. Every day, we see local businesses wasting hundreds and thousands of dollars on poorly-structured Google Adwords and internet advertising campaigns. 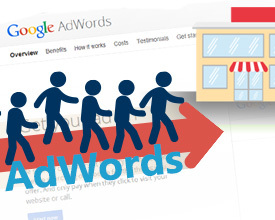 A well-structured Google Adwords campaign can pay for itself many times over. A poorly structured campaign, on the other hand, can drain your bank account before you even realize what is happening. That’s why it makes sense to consult with a Google Adwords expert who will make sure your campaigns are set up right from the very beginning. Google Adwords campaigns are complex to set up. They have many moving parts, and they require experience, skill and a significant time commitment to ensure that you are reaching the right customers, at the right time of day, and generating profitable leads instead of wasting money on unprofitable clicks. Our Google Adwords team uses a proven methodology to professionally manage Pay Per Click (PPC) Internet Advertising Campaigns with Google AdWords, Yahoo! Search Marketing and Microsoft adCenter. A thorough analysis of your business services. An In-depth keywords assessment tailored to your business. A properly-planned and expertly-structured advertising campaign. Proper ad group structures that are set up with relevant keywords. Professional assistance with ad copy development. Proper keyword ad copy and a relevant landing page for each keyword. An appropriate keyword bid strategy. Optimized and well-designed landing pages for ad destinations. A well-designed sales funnel and conversion tracking mechanisms. Google AdWords campaigns require ongoing, continuous monitoring to constantly improve the ROI.Once you have spoken with our team of professionals and have decided that we are the right fit for you, we will set up a meeting with your own Google account manager. Before the appointment, your account manager will study your website and research your industry, including general practices, your competition and your current Pay Per Click Strategy (if you have one) in order to get a sense of your goals and other factors that will contribute to moving your Pay Per Click approach forward. During your appointment, we will discuss your current account, your industry, your knowledge, and many other factors in detail. Then we will create an effective and profitable Pay Per Click Strategy based on the information you have provided to us. Our Account Managers work diligently to make sure your company is getting the results you desire. If you are ready to take your business to the next level, Schedule a call now.